Three species in the Emydidae family of pond turtles live in California. These are also the turtles Californians most commonly see in the wild. Although you may see pond turtles basking in the sun above water, they are primarily aquatic turtles and spend most of their lives in the water. Like all cold-blooded animals, turtles hibernate when temperatures become too cold in winter and food becomes scarce. Turtles living farther away from the equator are more likely to hibernate. Pacific pond turtles (Actinemys marmorata) are California's only native pond turtles. They also have the broadest distribution of any pond turtle throughout the state. These medium-size turtles have mostly dark-brown or olive shells, and may have cream or yellow spots on their heads. They live throughout western California, south into the Baja peninsula and north into Canada. These turtles have a short hibernation period in California, emerging as early as February and remaining active through November. When they do hibernate, they bury themselves underwater in the muddy bottom of the ponds, lakes and streams where they live. Although red-eared sliders (Trachemys scripta elegans) aren't native to California, they've been introduced throughout the state and are especially common in more populated areas. Most red-eared sliders are descended from turtles people bought as pets and later released into the wild. Named for the stripes of red that appear on the sides of their heads, they otherwise look like Pacific pond turtles. 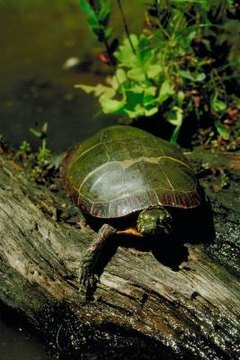 Red-eared sliders generally become dormant when temperatures drop below 50 degrees Fahrenheit, so those living further north hibernate, while individuals living in southern California may be active year round. They bury themselves underwater or in riverbanks or hollow tree stumps to hibernate, but may still come out on particularly warm and sunny winter days. Another introduced species, the Western painted turtle (Chrysemys picta bellii) is the most widespread turtle species in North America. These creatures live in ponds, lakes and streams with muddy bottoms throughout coastal southern California and well into the northern part of the state. Named for the red markings bordering their smooth olive-colored shells, the Western painted turtles are active year round in the south. Those living in the north go into hibernation in late fall, emerging in March or April. For cold-blooded animals, Western painted turtles have a fairly high tolerance for colder temperatures, and can even be seen swimming in early spring beneath ice that has yet to thaw. Pond turtles in the Emydidae family are some of the most popular turtles in the pet trade. Pond turtle owners should be sensitive to their pets' hibernation needs, even if they live in southern California and experience relatively mild winters. Pet turtles of species that hibernate should be given a safe place to do so, or moved to an indoor aquarium during the winter if their outside habitat can't be controlled. Hibernating turtles tolerate temperatures between 39 and 50 degrees Fahrenheit, and shouldn't be left in shallow ponds if there's a danger the water could freeze solid.